For three days starting today until August 19, CJ CheilJedang is giving a presentation on the functionality of Korean fermented food at the international symposium of the Korean Society of Food Science and Technologyheld in EXCO, Daegu. At the symposium with the theme of ‘Food Science for Daily Living via Innovation and Convergence,’ CJ CheilJedang Food Research Institute has a separate session involving the topic of ‘Biological Function and Metabolomics (study of function and interaction of metabolites) of Fermented Foods.’ CJ’s exclusive session will introduce the research findings led by a team of professors who conducted the joint research on the functionality of fermented foods such as fermented soybean products and fermentation enzymes in cooperation with CJ CheilJedang. The presentation will be carried out in 4 topics: immune function of doenjang, anti-obesity function of gochujang, intestine health function of fermentation enzyme, and fermentation metabolome of fermented soybean products. The first topic, which is the immune function of doenjang, is presented by Professor Yong Heo of Occupational Health at Daegu Catholic University. He introduces that as a result of animal testing, rats that ate doenjang had stronger immunity than those that did not, showed improvement in resistance to cancer and viral infection, and suppressed atopy as well. The second topic, which is concerning the anti-obesity effects of gochujang, is presented by Professor Jae-Joon Lee of Food and Nutrition at Chosun University. He introduces that rats that ate gochujang fermented with CJ’s self-developed strain show an even decrease of obesity-related indicators such as weight and body fat. The third topic, which is the intestine health function of fermentation enzymes, is presented by Professor Sae-Hun Kim of Food Bioscience and Technology at Korea University. He talks about how rats, which ate grain enzymes made by putting effective microorganisms into supergrains like oats and quinoa and fermenting them, showed a decrease in toxins in the body or inflammatory factors with reinforced intestinal mucosa. The last topic, which is on fermentation metabolome of fermented soybean products, is presented by Professor Choong-Hwan Lee of Biotechnology at Konkuk University. He introduces what metabolomes are effective for our bodies among substances created in the fermentation process when we add microorganisms into raw materials of fermented soybean products such as soybeans, rice and hot pepper powder. 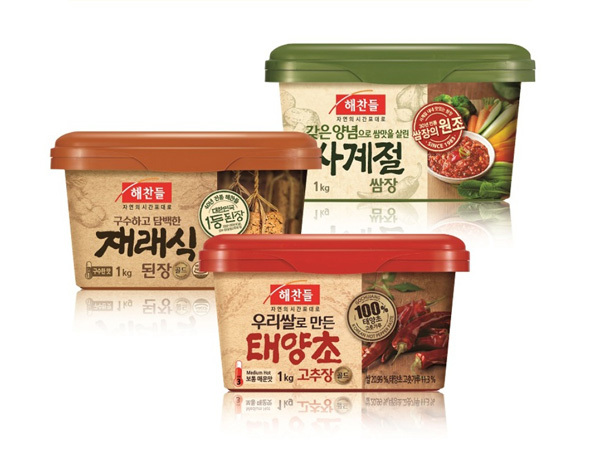 This research is conducted using CJ CheilJedang products currently being sold in the market, such as Haechandle Premium Doenjang, Taeyangcho Gold Gochujang, Hot Pepper Paste Made with Korean Rice[p1] , and HOPE Fermentation Enzyme. This proved that fermented products applying CJ’s excellent strains separated from fermented soybean products, meju and makgeolli nuruk feature excellent functionality due to various bioactive substances created in the fermentation process. The article on gochujang has been published in the ‘Journal of Food Science & Technology’ which is an international journal on food and nutritional science, and the article on doenjang was published in the ‘Journal of Veterinary Science’ which is an international journal on veterinary science and laboratory animal science. The results of the fermentation metabolomes of fermented soybean products were published in the high-ranking journals of food science such as ‘Food Research International’ and ‘Molecules,’ thereby providing international publicity to the scientific excellence of Korean fermented foods.